‘What foods can I eat on the low FODMAP diet?’. This used to be one of the top search terms that cropped up on the stats for this blog. But oh how things have changed over the past few years – for the better as well! It used to be that websites were full of out of date information on foods you can and cannot eat while following the low FODMAP diet for 2-6 weeks. Funnily enough until fairly recently the most out of date information used to be found on a website set up specifically to help people with IBS! (I won’t mention the name). Thankfully for those searching for lists of suitable foods on a low FODMAP diet you now have some excellent trustworthy choices. The first section of this article highlighted the 3 best ways to find lists of foods high and low in FODMAPs including; the Monash FODMAP app, FODMAP friendly app and the most trustworthy free lists of FODMAP foods on the internet. In section 2 the article also highlights the many changes in the FODMAP content of foods over time and the confusion this can create. Available on Android and iPhone devices for roughly £5. Contains the largest database of foods and food products detailing the different types of FODMAPs found within the foods and uses a traffic light system to indicate high or low levels of FODMAPs. If you are going to try and follow the low FODMAP diet yourself without the help of a registered dietitian then I suggest you invest in the Monash University low FODMAP Diet app. If you do not have an android or iPhone then you can get a booklet of the information from Monash University. I don’t get any benefit from promoting this but I am because Monash is the university that help research the the low FODMAP diet and revenue received from the app will go towards funding further research. This is of course the only way treatment will improve for people with IBS and other gastrointestinal disorders. Where I previously worked at King’s College London we also produced booklets with information on the FODMAP content of foods based on data from Monash but these were only available for registered dietitians. Now King’s College London has produced an app of it’s own in collaboration with Food Maestro and some funds from sales of this app also go towards funding FODMAP research. See our Best Low FODMAP Resources for more information. Available on Android and iPhone devices for roughly £2. The app provides lists of foods and food products high and low in FODMAPs plus additional detail on the different types of FODMAPs and amount of FODMAPs found within a food. I am starting to use the FODMAP Friendly app a lot more as it now has a good amount of tested foods and these will of course continue to grow. There are some discrepancies between the data of FODMAP content of foods in the FODMAP Friendly app compared to the Monash app. This is both interesting and confusing but also extremely useful as it means people start asking why there are differences and this leads to further analysis. A classic example was a banana which Monash always had listed as low in FODMAPs but FODMAP Friendly listed a banana as high in fructose. On subsequent re-analysis Monash also found that ripe bananas are high in fructose, agreeing with FODMAP Friendly, while less ripe bananas are low in fructose and therefore low FODMAP. Analysing the FODMAP content of foods is a difficult process as Monash have written about on their blog before, including an overview of the whole process (see here). The competition between these two centres will likely mean more re-testing and hopefully more accurate analysis. In fact I tend to check Monash first and then see what FODMAP Friendly found in their analysis. Monash university were the first and only centre in the world for providing information on the FODMAP content of foods until the arrival of the FODMAP Friendly programme. As their websites states the ‘FODMAP friendly certification program, incorporating the FODMAP Friendly logo, is the only registered certification trademark worldwide certifying FODMAP levels in food products that have been laboratory tested to be low in FODMAP’. Personally I think it is great we now have two centres that are analysing the FODMAP content of food, although unfortunately I’m pretty sure Monash would disagree with this. Even so this competition and difference in FODMAPs found in the same foods has meant Monash has retested several foods, some of which are highlighted in the section ‘Recent changes to the FODMAP content of foods‘ at the end of the article. Nowadays there are several trustworthy sources for lists of FODMAP foods on the web produced by experienced FODMAP dietitians or research organisations. I have linked a couple of free lists I like below. Usually these particular websites keep the information up to date as the FODMAP content of foods changes as further analyses takes place. However unless the lists are constantly being updated they will soon be out of date or worse misleading or incorrect. It does not matter if there are a few inaccuracies and discrepancies in these lists. After all it is a low FODMAP diet not a ‘FODMAP free’ diet, therefore as long as you are significantly restricting your intake of FODMAPs to a low level you are doing the right thing. Important to remember is that all these lists will take their information from the Monash University Low FODMAP app. The Monash app is being constantly updated so if you want the most accurate information this is clearly your best choice. My GI Nutrition – A collaboration between American research universities and Nestle this is a useful website for a range of information on the entire FODMAP dietary treatment. It has online and downloadable lists of foods high and low in FODMAPs however the downloadable lists are not being updated as often as they should be…. Kate Scarlata – Kate Scarlata is a dietitian in America and has downloadable low FODMAP diet checklists which she attempts to keep up to date quite regularly and will also highlight when her checklists are out of date. To access both of these resources you do not need to sign up to anything unlike many other ‘free’ resources. However why rely on a published list that can go out of date so easily? If you are actively seeking to improve your IBS symptoms then spend a small amount of money on the Monash app and get the best information available from the centre that actually analyses the FODMAP content of food and conducts the research. I think the Monash app (and the FODMAP Friendly app) is a brilliant resource. However as more foods are being tested and as we are starting to realise how different food processing techniques can alter the FODMAP content of foods I also think things are becoming more confusing. Here are a few foods that can cause some confusion. Are oats high or low FODMAP? Oats can be a confusing food on the low FODMAP diet. When analysed (by Monash) for their FODMAP content oats from different regions around the world are found to have different amounts of FODMAPs. For example oats (uncooked) are high in galactooligosaccharides (GOS) & fructans when using more than 78g in Australia, high in galactooligosaccharides (GOS) & fructans when using more than 100g in the UK and high in galactooligosaccharides (GOS) & fructans when using more than 130g in South Africa. Also ‘quick oats’ are moderate in GOS & fructans when you have 47g but unfortunately at present we do not have data on a high FODMAP range therefore stick to 47g or less of ‘quick oats’. In one of the updates to the Monash app fine oatmeal is high FODMAP (contains fructans) whereas coarse oatmeal is low FODMAP. When I asked the team at Monash about this they could not confirm why this was at this stage. They mentioned it may be caused by the additional processing steps which may have caused the fructan levels to drop in the fine oatmeal, compared to the coarse oatmeal. Due to the smaller particle size of the fine oatmeal the fructans are more available hence the analyses by Monash found them high FODMAP. It is likely that coarse oatmeal contains exactly the same amount of fructans but they are harder to extract, both in the analyses and when we digest them. Hence coarse oatmeal was found to be low FODMAP. Oat bran by the way is low in FODMAPs at a serving size of 22g but is high FODMAP at 55g. Although the app does not stipulate one can assume roughly 33g of oat bran must be moderate in its FODMAP content. The FODMAPs found in oat bran are fructans and GOS at 55g. Is spelt high or low FODMAP? Spelt and spelt products are still causing lots of confusing. If you use these products or are thinking of having sourdough spelt bread have a read of this article that discusses all the complexities of spelt. By the way the sourdough process in bread making affects FODMAPs making sourdough spelt bread low FODMAP and to find out why see my previous blogpost on this. Is rice milk high or low FODMAP? Other oddities included rice milk originally being labelled high FODMAP when after being re-tested it was found to be low FODMAP. Rice itself is low FODMAP of course. Apparently a process during the production of rice milk led to the analysis confusion which is nicely explained by Monash on their blog post on rice milk. Is broccoli high or low FODMAP? Once re-tested broccoli was only found to contain high amounts fructose (not sorbitol) in the stalks of the broccoli at serving sizes of 1 cup / >65g. I’m not sure who only eats the stalks of broccoli but worth knowing none the less. If you stick to eating the heads of broccoli only then these are low in FODMAPS or if you eat the whole broccoli then this is also low FODMAP i.e JUST DON’T EAT LOTS OF STALKS! You can read more here on the Monash blog. FODMAP Friendly also provide updates on specific foods or food products, some of which Monash have not tested as yet. For example FODMAP Friendly tested xanthan gum which the food industry particularly like to use in gluten free products as it acts as a food thickener and provides texture and palatability. It was also assumed xanthan gum was low FODMAP but had not been analysed. FODMAP Friendly confirmed that xanthan gum was low FODMAP at 5g in one of their blog posts you can read here. Are blackcurrants low or high FODMAP? Blackcurrants are a fairly popular fruit in the UK and people have been asking for years if they are high or low FODMAP but as yet we have not had a full answer. Back in 2015 Monash did some preliminary testing and found blackcurrants to be high in sorbitol but required further testing before inclusion in their app (see here). Blackcurrant jam from Norway however has been tested and found to be high in fructans at 1 tablespoon (20g). One can assume that it is likely most food products that contain blackcurrants e.g. Ribena Blackcurrant Drink, will have some level of FODMAPs in them and should be avoided during the restriction phase of the low FODMAP diet. Green Bell Peppers have been analysed by Monash University as being low FODMAP at 52g while 75g contains moderate levels of the polyol sorbitol. A few years ago green peppers were considered low FODMAP. Interestingly I get a fair number of patients report peppers, but not green in particular, trigger symptoms. Maybe this was due to the sorbitol content all along, however peppers also contain capsaicin which some research has linked to triggering upper GI symptoms Although 75g is moderate in sorbitol slightly ridiculously Monash suggest 80g of green bell peppers is high FODMAP (sorbitol) so make sure you have some good scales!! Blueberries were once a go to fruit for a low FODMAP option but now Monash analyses has identified moderate amounts of the FODMAP fructans in 50g of blueberries and only 40g are low FODMAP. 125g of blueberries is the cut off for high FODMAP fructans. Courgettes! Again a previous staple of the low FODMAP diet a courgette / zucchini is now high in the FODMAP fructans at >85g, moderate in fructans at 75g while low FODMAP at 65g. The 10g differences seem a bit close so perhaps it is not a sensible idea to have anymore than the 65g low FODMAP recommendation. These particular 3 foods above have formed the basis of many a patients low FODMAP diet for years and they have achieved very good symptom control on a low FODMAP diet including these foods. I can remember many a recipe including ‘courgetti’ (courgette spaghetti) to replace wheat pasta! Oh how times have changed….. There have of course always been some low FODMAP foods that when eaten in larger portion sizes contain higher amounts of FODMAPs and this useful article from A Little Bit Yummy highlights a few of these foods: Low FODMAP Foods That Need Portion Control. Thankfully Monash are trying to address these confusions with regular blog posts explaining why these differences are occurring and you can sign up to regular updates on their website. As you can with FODMAP Friendly as well. Lists of high and low FODMAP foods obviously do not explain everything you need to now about the FODMAP dietary treatment. The importance of your overall diet must still be considered in the context of following the restriction phase of the low FODMAP diet for 2-6 weeks. This can be difficult for someone to achieve without having the ability to critically assess their dietary intake. Hence support from a medical professional and dietitian is always the best option. Indeed there are many changes to your diet and pattern of eating that might be just as effective as a low FODMAP diet in reducing your symptoms. I highly recommend reading this article and implementing whats called the ‘first line dietary advice for IBS’ suggested in the article before starting a low FODMAP diet. 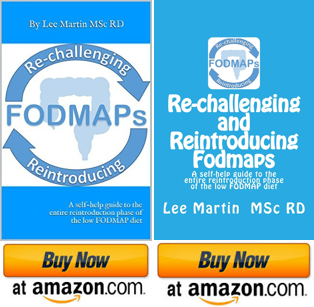 Finally many websites promoting the ‘low FODMAP diet’ rarely mention the other 2 phases of the diet including the reintroduction phase and a long term modified low FODMAP diet! The Low FODMAP diet has shown to be effective in 50-80% of people when administered by a registered dietitian and by doing the diet yourself the success of the diet may well be diminished. I really would urge people to get referred to your local dietetic service / professional for advice and support on the entire low FODMAP diet. If you are reading this in the UK then your taxes are already paying for the community and hospital based dietetic service so make use of them! If you are having trouble getting a referral to a dietitian then read this article which will give you some important tips: Managing IBS. Problems with GP’s, national guidance and the low FODMAP diet. There may be many other factors apart from just FODMAPs that contribute to a successful diet in relieving IBS symptoms so please check with an expert who will consider your individual requirements. Good news! The first ever book dedicated to reintroducing FODMAPs is now available to purchase exclusively on Amazon. The book is titled ‘Re-challenging and Reintroducing FODMAPs – A self-help guide to the entire reintroduction phase of the low FODMAP diet’. Click on the logo for more details. Dietitian authored articles on the FODMAP dietary treatment available here. The Best Low FODMAP Resources here. I have actually emailed a fructose malabsorption website about their inaccurate sugars and sweeteners list and the reply was basically that they’d fix it when they have the time. That was months ago and no change, not even to remove the list. So many people link to it in the Facebook FODMAP groups, too. It’s frustrating! I know you think they would be the first people to make changes and updates but it seems accuracy of information is not a priority for many websites claiming to help people. And as you say these incorrect messages are passed around so easily without anyone checking. Oh dear! Anyway hope all is well with you Nataliya. If fructan levels drop in fine oatmeal, does that not mean that it is the low FODMAP and coarse oatmeal is high? Hey Jonah thanks for the nice comment. I see what you mean it does read slightly confusing actually and to be honest these new analyses are confusing!. What I should have written was that Monash were saying is that most likely due to the smaller particle size of the fine oatmeal the fructans are more available hence their test found them high FODMAP. It is likely that coarse oatmeal contains exactly the same amount of fructans but they are harder to extract, both in their tests and when we digest them. hence they were found to be low FODMAP. Hope this clarifies that for you it is very interesting stuff. Thanks so much! That clarifies a lot. What is the best way to stay up to date on their continuing research? So true! I was just searching for ‘What foods can I eat on the low FODMAP diet?’ when I came to this site. This is one comprehensive post! Love it! I do use the Monash app for some time now since I was diagnosed with IBS and was now on the low FODMAP diet.. It feels so much better to eat with the help of these low FODMAP diet apps knowing you’ll feel fine after! Thanks! Thanks Amy that is a useful link.